Add Some Frosty Glow Color to your Glass Order! Combine the unique effect of frost and color! Available in nine color possibilities, the Frosty Glow process adds value, depth, and texture to your glassware while creating maximum contrast to make your logo pop! 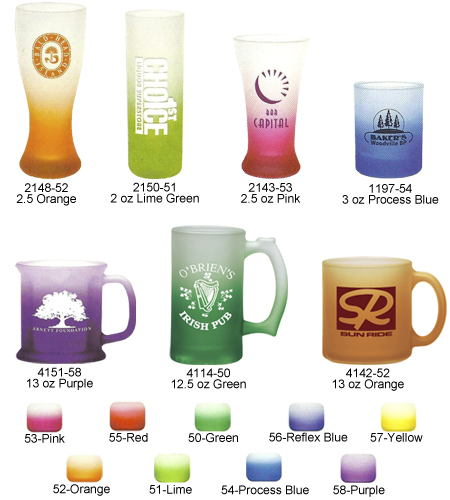 To order, choose your glassware number and add the color code listed below. Call 1-800-233-0828 to place your order. 2150- 2 oz Frosted Tall Shot Glass 2.85 2.55 2.49 2.45 2.39 2.29 1-1/4" 3"
1197- 3 oz Frosted Shot Glass 3.15 2.84 2.79 2.75 2.69 2.59 1" 3"
4114- 12.5 oz Frosted Mug 4.27 3.91 3.79 3.69 3.59 3.49 1-1/2" 2-1/4"
4142- 13 oz Frosted Coffee Mug 4.53 4.14 3.99 3.92 3.84 3.66 1-1/4" 2-7/8"
It's easy to have your own Custom Glasses in any frosty color you choose. Simply choose your glassware, then choose one of the nine available glow colors and call 1-800-233-0828 to submit your order. You will receive your Custom Frosty Glow Glasses in about 3 to 4 weeks. Rush delivery is available.